We always remember that we just came to have FUN, & we discover that the better we get, the more fun it is. So let’s keep those happy tunes going on your ride home, & feed your ukulele fever. Jeff will continue to share familiar, fun songs for you to learn to strum & sing along to, with plenty of new challenges. For example, more than 1 strum rhythm per song, chucking, & a sprinkling of more difficult chords. FUN FUN FUN! 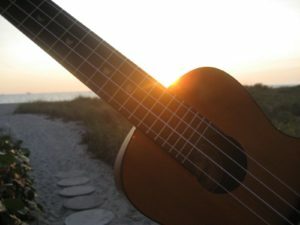 Jeff Hanna, co-owner of The Rhythm Inlet, & steward of the ukuleles at The Ukulele Place, combines his masterful teaching style, a background in singing & performing in small a-cappella groups, & a love of strumming a tune on the ukulele, to inspire & stretch his ongoing intermediate uke students. Cost is $60 each month, is a 2-month series, & includes your monthly Membership to The Rhythm Inlet & The Ukulele Place.